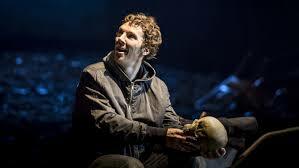 For nearly four acts, Benedict Cumberbatch, starring in the National Theatre Live broadcast around the world yesterday, is the best adjusted – and best – Hamlet I’ve seen. That the production falls flat in Act V is a disappointment, but does not take away from the many accomplishments of this fine staging. Any performance of Shakespeare’s “Hamlet” succeeds or fails primarily on the strengths of its lead actor and Cumberbatch’s Hamlet is very good indeed. He fully and convincingly engages with all of the character’s emotions: Hamlet’s grief, his sorrow, his anger, and especially Hamlet’s humor which is the lightest and most sparkling of all the readings of the Danish prince I’ve seen. This leads Hamlet to contemplate suicide and to embrace a half-madness which serves both to disguise the threat a sane Hamlet poses to his uncle’s stolen crown and to disguise the insane parts of Hamlet from easy recognition. In Cumberbatch’s Hamlet, his madness is all tactic to confuse Claudius. This makes Cumberbatch’s “antic disposition” particularly playful and makes his Hamlet particularly likeable because the whinging, self-importance, and condescension frequently seen in the Danish prince are muted. It does mean, however, that Hamlet’s contemplations of suicide come off as passing thoughts, rather quickly forgotten. Cumberbatch isn’t the only good performer in this National Theatre Live production. Ciaran Hinds is very good as a false, awkward, and cowardly Claudius unequal to the tasks of playing either the public or the private role of king. Sian Brooke’s is moving as an Ophelia whose vulnerability is evidence from the beginning of the play, and whose descent into madness is credible and heart-breaking. Anastasia Hille’s Gertrude manages to yell at top voice and convince us of her passion in her confrontation with Hamlet. This is more than I can say for the actors playing Laertes and Horatio both of whom rely on volume when emotional connection with their roles seems to desert them. (Are bellowing Horatios the new style? It’s not a good style.) Polonius, Rosencrantz, and Guildenstern are played for laughs and deliver. The Player King is meant to be a bad actor and succeeds competently. Like most staging of most Shakespeare, the National Theatre Live production tries new things, some of which work and some of which don’t. The generally accepted version of Shakespeare’s “original” text has been edited more than usual, with many scenes moved around and lines traditionally spoken by one character often spoken by another. This emphasizes the elements of Hamlet the director seems to want to emphasize and works just fine until Act V (more on that in a minute). For many of Hamlet’s soliloquies, Cumberbatch steps out of the action of a scene and is isolated in a spotlight (very effective). There is at least one instance where the characters are running frantically around on stage while music pounds and strobe lights flash (this should be banned from the stage by statute). The duel scene is so rushed and hugger-mugger that it felt like Gertrude and Claudius were alive one moment and dead the next. When Hamlet is exiled to England, the stage is inexplicably filled with black dirt, a gimmick making pretense toward grand visual metaphor though exactly what the metaphor might be, who can tell? Since Cumberbatch’s Hamlet bears up reasonably well under his pain and the task of avenging his father’s murder, he never gets to acceptance or resignation. He simply dies from the machinations of Claudius and Laertes, about as happy and unhappy as he ever was. This does not detract from my forming conviction that Cumberbatch’s Hamlet is the best and most appealing I’ve seen on screen. Not to mention the sexiest. I hope the National Theatre makes this production of “Hamlet” available for streaming eventually. I’d like to see it again. Check out my other reviews of Hamlet movies starring Laurence Olivier, Mel Gibson, and many more. I’m hoping to see this at one of the film screenings as I’m intrigued by the reading of Hamlet. It’s not often that a production goes solely with the idea that Hamlet is feigning madness. Plus, I’m a big Jim Norton fan!